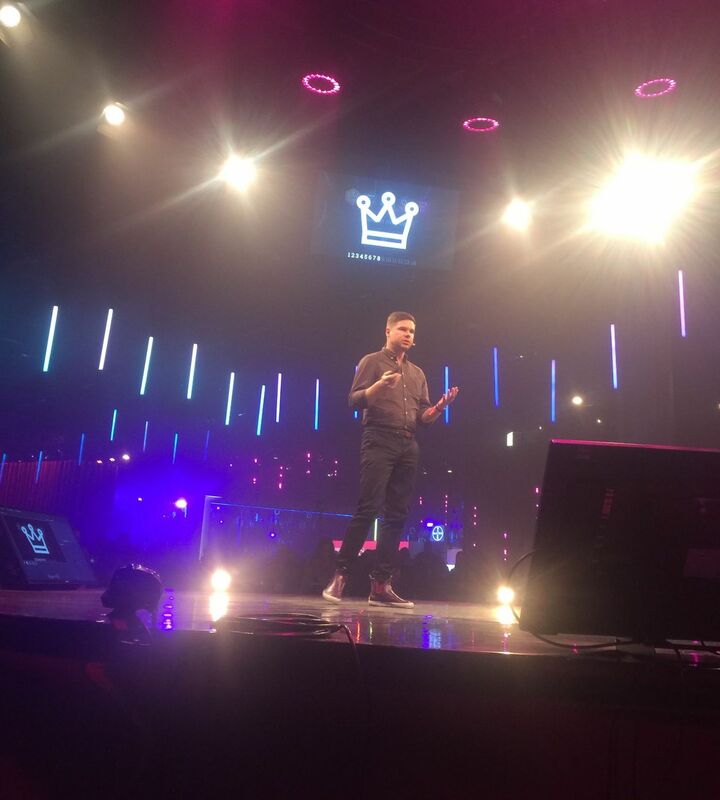 This was my third year at Slush and so I shouldn’t get so easily impressed, as the quality has been consequently high these three years, but I was. Read on and I’ll tell you why. First, let’s set the scene. And this particular scene has lots and lots of laser lights. Three years ago, we were at Slush running from investor meeting to investor meeting trying, too hard probably, to get our growth story across. We must have had some success, as we were back the next year after raising our A round, with my co-founder Thomas Walle presenting our story on a main stage bathing in lasers as representatives of “the next generation of Nordic game changers”. This year we were invited back yet again, for the first time, refreshingly, not pitching Unacast directly but to talk about how we’ve had success in our focus on gender balance. And this time yours truly was the one presenting on stage. I was on stage for 14 minutes. The rest of the time I spent mostly backstage and that’s where I experienced what impressed me – massively. In order to turn this text into something a little more interesting, and not only another praise of the people behind Slush, I’ll attempt to tell the story in the form of seven lessons to ambitious startups. We didn’t actually plan to attend Slush this year, as we are in the middle of a growth phase and are using most of time and energy inwards. We are however always regularly sharing stories in the form of blog posts, and one of these caught the eye of Slush CEO herself, Marianne Vikkula, who were obviously focusing outwards. She had read my text on how we stopped talking about gender diversity and did something about it, and she reached out to me on Messenger and asked if I wanted to come and share that story on stage. I believe it to be an important story to tell. I said yes. Without Marianne and Slush actively participating in the startup ecosystem to discover me and my blog post, I would not have had that opportunity. Slush has several customer categories. The startups. Of course. The investors. Of course. And equally important as those are the ones that present on stage, although they, opposite the other customers of Slush, don’t represent a revenue source as they don’t pay to attend. From the moment I confirmed my attendance, Slush was treating me as their #1 customer, helping with hotels, giving me regular updates and helpful guidance on how to maximize my visit. I was also assigned my own Slush Buddy - but more on that in Lesson 4. In short, I felt wanted. As I arrived in Helsinki, I was reminded of something I had also thought the previous two years. Slush has cleverly turned something drab, Helsinki in November, to precisely the reason for why you should come to Helsinki in November. You are left thinking that If they can get so many people to visit the conference every year at this time it must be awesome. In doing so they show their customers that they do not only understand their weaknesses but also that they don’t care about those weaknesses. Case in point, once you enter the doors of the Slush conference you are transported into a different universe - a universe very far from drab. You’ll find the same contrast in the conference name itself: Slush; the useless-phase-in-between-snow-and-water. Slush has by talking, and making fun, of their weaknesses, turned them into strengths, thus ensuring that they are no longer limited by them. The second thought when I landed in Helsinki was one of delight as I was being welcomed by my own driver that would take me to my hotel, and that would later drive me to the conference. No cost. That driver was assigned to me by my Slush Buddy, Alexandrine. As you could read in Lesson 2 I was already impressed by the level of personal service before I landed in Helsinki, but little did I know that this was only the start. There were 2400 volunteers at Slush, more than one per ten visitors, and it shows. Alexandrine literally stayed by my side every minute while at the conference, helping me find my stage, to connect with the technicians to check my deck, and to even bring me food as I had arrived straight from the airport to hold my presentation. When I after my presentation and the following Q&A had to quickly get back into town for a meeting with The Nordic Web Angel Fund, which Thomas and I had just invested in, she arranged for a car to take me back. No cost. And although I was impressed with her knowledge of everything I needed help with, I was even more impressed with her positive and professional attitude. She was obviously proud of Slush, and Slush should be very proud of her. I have presented on many stages throughout the years and never ever has everything gone smoothly. Either the correct fonts are not installed, or the clicker doesn’t work, or the resolution of the projector is off. And most often the technicians think I’m being annoying for double-checking. Not only did the technicians at Stuff happily double-check for me and had a routine for just that, but everything was already flawless. Everything worked as I wanted it to, and I could focus all my energy on the presentation itself. After I was done with my part I stepped out into the big conference hall for a second to take it all in. Presentations, booths, people, music, lasers. Magic. All coming together to a greater whole. Seeing all the other people at Slush having variations of my own experience reinforced the feeling that this was not a fluke and I wasn’t the only one being impressed. Massively. I was sure then that I would be coming back. Again, and again. That’s exactly what Slush is doing. And you should too.